The film tells the story of the early years of smuggler Han Solo, who was played by Harrison Ford in seven movies in the "Star Wars" franchise. The film stars Alden Ehrenreich as Solo and Donald Glover as Lando Calrissian, both actors playing younger versions of the characters made famous by the original "Star Wars" trilogy. "Solo" also features fan favorites Chewbacca and the Millennium Falcon — in its earlier and spiffier days before being introduced as a grimy, albeit fast, hunk of junk in the original "Star Wars" film. Solo is one of the franchise's most popular characters. Ford's portrayal of the gruff smuggler in the original "Star Wars" catapulted him to stardom and has become one of the characters most closely associated with the actor. Initial reactions online after the premiere were positive, praising Ehrenreich and Glover and the film's space heist action sequences. Full reviews won't be released until Tuesday. For the premiere, Disney built a giant replica of the Falcon on Hollywood Boulevard. Glover was seen posing underneath the giant prop. "Solo" will be released May 25. The film is the second stand-alone film set in the "Star Wars" universe. "Rogue One," released in 2016, told the story of the theft of plans for the superweapon the Death Star, which was destroyed at the end of the 1977 film that made Star Wars into a global sensation. Disney has become known for its elaborate premieres for its "Star Wars" films. It placed an X-Wing replica on Hollywood Boulevard for "Rogue One," and a simultaneous debut at several Hollywood theaters for 2015's "The Force Awakens," which was the return of Ford, Carrie Fisher and Mark Hamill to the franchise after a 30-year hiatus. "Solo" is the biggest role yet for Ehrenreich, who starred in the Coen Brothers film "Hail, Caesar!" 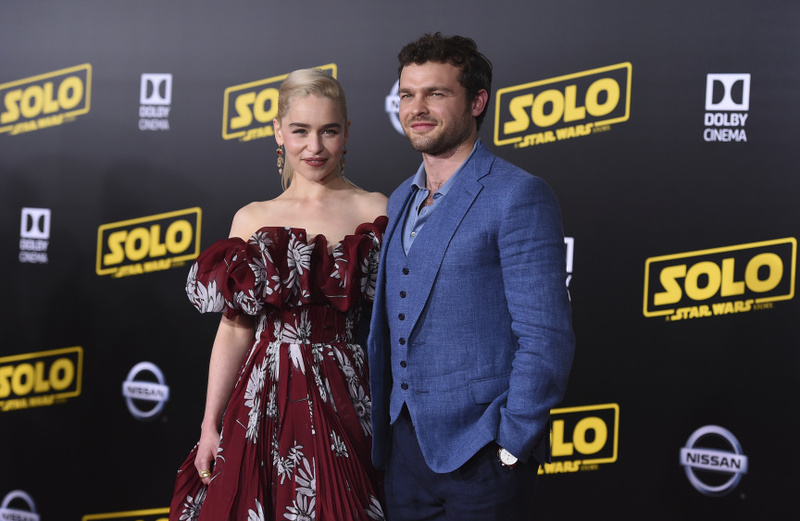 While many other characters have made cameos in "Star Wars" films that tell stories before the original trilogy, the franchise has stayed away from showing Solo as a younger man. The new film also features Glover stepping into a role closely associated with another actor: Billy Dee Williams played Calrissian in "The Empire Strikes Back" and "Return of the Jedi." "He was the first toy I ever had," Glover said. "My dad got him for me." The "Atlanta" star said when he got the role, he called his father, even though he wasn't supposed to talk about it yet.